Today’s Providence Business News reports on the divergent visions of the Providence Mayoral Candidates for the Providence Waterfront. As with many issues, Elorza wants to continue the Taveras position on Allens Avenue, which is to reserve the land there, through zoning restrictions, for industrial use only. Supported by the City Council under President Michael Solomon and existing Allens Avenue landowners, that position was a change from Cianci’s late 1990s plans and those of his successor, David N. Cicilline. Elorza does want to increase exports from the working waterfront, through market studies and trade missions, activities normally handled by state economic-development officials. Not to be overlooked, the people who currently own the land along the Allens Avenue waterfront support this direction. Cianci’s waterfront plan calls on the city to suspend work on new, tighter zoning rules for Allens Avenue that actually became law in July. What he would replace them with if they could be reversed is not specified, but would presumably allow at least nonindustrial commercial development, and recreational use, if not residential. He would then look for state and federal funding to buy waterfront land owned by utility National Grid, and possibly other private parties, to build a cruise-ship terminal, medical-office building and soccer fields. There’s a lot going on in that plan. There’s the possible legalities of zoning the usage of land out from under existing businesses, there’s mythical state and federal funding that may or may not present itself, and there’s the if you zone it and buy it, will they come aspect of the possible development. Not to mention that much of the current use of the waterfront land is devoted to energy, and that activity has to exist somewhere for our city to function. Everyone knows I love a good rendering, and this rendering is all kinds of pretty, right down to the ferris wheel, but this is no closer to reality at this point than it was 15 years ago when it was called New Cities. As I asked on Twitter when this latest plan was introduced, why would we create a new neighborhood from scratch when Capital Center, Downcity, the 195 Land, and Jewelry District are so far from done yet? Let’s focus our efforts on getting done the parts of the city we’ve started working on before chasing dreams along Allens Avenue. We have a Waterfront north of the Hurricane Barrier along the river that is adjacent to existing neighborhoods and has already started to develop in Capital Center. We need to focus on building out the Capital Center and 195 Land waterfronts (plus Corliss Landing and the Shooters site). That’s plenty to keep us busy for 20 years. The work we’ve done to redevelop downtown will feed efforts to redevelop our riverfront moreso than than the Allens Avenue area which is divided from Downtown by the relocated 195. Allens Avenue suffers from the same problem we just solved for the Jewelry District, isolation. And if we try to think regionally for a moment (I know, as New Englanders this is hard), East Providence has planning well underway for mixed-use activity along their waterfront, development that need not displace existing industry and will have a positive impact on Providence proper. A well-developed waterfront in East Providence makes the region all that much more attractive. The Allens Avenue waterfront area is far from perfect. Expansion of our industrial base needs to include more than scrap metal. As we prepare to usher in a new adminstration in City Hall, we should commit ourselves to spending the next four-years on a cohesive plan to expand jobs and industries along our waterfront, and integrate that development holistically into the rest of the city and yes, the region. Why couldn’t a Cianci type approach be applied to the area north of Conley’s Dock wrapping around to the old Shooters site? Condos, hotels, and cruise lines…big taxable income. The “working waterfront” and more exports?? ?…what more exports??? I don’t understand why we can’t have both. Why not allow zoning for either use, and people can just choose according to what suits their needs at any given time, or on any given plot? I hate the way this proposal is so full of grass. . . The suburbs rear their head! What often happens when you try to co-locate housing, office, recreational, etc. uses with industry, is that the other uses start to complain about the industry. If the waterfront is populated with wealthy, voting, campaign donating, condo owners, they are the squeaky wheel and the industry gets the shaft. There are covenants that can be written into rental or sales agreements that are an explicit understanding that you are moving in next to industry, but that only goes so far to quiet the squeaky wheel. As far as the space north of Conley Wharf. We could have mixed-use from Conley north (again, realizing that Conley buts against industry and the issues I outlined above), but it cannot connect direct into the Jewelry District or Shooters site. The tank farm next to Collier Point Park needs to stay there. The Hurricane Barrier is, well, a barrier. 195 and 95 are barriers. Driving, walking, biking, busing… Allens Avenue is really far from Shooters in the scheme of things. And really, why go to the effort of trying to create a new neighborhood from scratch, on a couple blocks of Allens Avenue, that is so isolated? We have the whole rest of the city that needs developing. There have to be far more productive — and, I would imagine, less environmentally detrimental — industrial uses for that land than towering pules of scrap metal that have a penchant for randomly busting into flame. In large measure, I agree. I wasn’t implying that it would be a contiguous single development. The industrial area and the Port of Providence cannot export things we do not produce. That is a limited tax base. I fully agree that there is plenty of residential and business growth opportunity in other parts of the city to cultivate as well. But a broad and bold vision is needed. I’ve always wondered why we couldn’t move most of that industry to Quonset Point and replace it with a similar vision as depicted in the image above. However, Jef makes all the correct points as to why, even if moving those industries south were an option, our focus ought to remain on the areas we’re currently struggling to develop. Jef et. al., I just wanted to point out that Cianci’s waterfront vision only covers the area north of Thurbers Ave. It involves relocating the water-dependent industries that are incompatible with other uses, such as the scrap metal yards, to the Port of Providence farther south along Terminal Road. The Port has ample space for them and was incorporated as a semi-public entity for that purpose. Land swaps are tricky of course, but it worked in Capital Center and it could work there too. As someone who bikes Allens Ave several times a week, I can see that the area north of Thurber’s is sprawling, badly deteriorated, and minimally used. Several years ago, the Working Waterfront lobbied to kill the community-crafted vision of Providence 2020, promising a boon of exports with jobs to follow. But the candidate claims that there is only about one job per acre now along that 63-acre stretch and it is not hard to believe. Then there is the issue of public access to the waterfront. Yes, as a city we have India Point Park, and the downtown rivers. But on the South Side, the entire length of Narragansett Bay is blocked off with the exception of Collier Point. That makes South Providence the only bayside community in Rhode Island without waterfont access–is it any coincidence that it also happens to be the poorest? Exclusive industrial zoning may have been justifiable half a century ago, but these days it isn’t doing much for the neighborhood or for the city at large. Well said, Sam C. – and that is my point as well. Vast opportunity on valuable waterfront on a deep water channel is being wasted by the Tavares/Elorza approach. Developing the waterfront is not inconsistent or contradictory of growing the Financial District or the I-Way District. The lack of boldness is concerning. So should nothing be built in the city unless it’s on one of the parking lots right in the core? I like Cianci’s idea much better. No, we should build things where they make sense and where there is a developer with the funding and the vision to get something done. We should not be starting a whole new project to transform a neighborhood that does not want transforming or need transforming or that our economy does not have the capacity to transform when we have Capital Center, Downcity, the Jewelry District, and the 195 Land (and throw North Main Street into that mix if you want) that are mid-transformation and need our attention. Once the sites that would be appropriate for maritime industrial use are gone, they are gone for good. This reminds me of the foolhardiness of allowing homeowners to encroach on unused railroad ROWs. Plus, that rendering clearly incorporates the assumption that no one will ever come or go by any means other than private car. The old rescue-the-city–-making-it-just-like-a-suburb. As a Landscape Architect I think the rendering above is beautiful and wonderfully done as a concept. I would like to see a little more development implemented into the space but the waterfront idea is wonderful and could boost this city immensely. I recently visited the waterfront park in Philadelphia and there were people in every direction enjoying the space in ever direction. Cruise ships making another stop in RI after Newport is always a plus. That’s thousands of people. But it does make you wonder where the current industrial businesses will move too. > No, we should build things where they make sense and where there is a developer with the funding and the vision to get something done. Conley and Paolino. Not the highest on my list of visionaries, but they have money and they want to develop. The destination would be Providence – not RI. And there is no need for any existing business to move if you use the land at Conley’s Dock area and the are around the old Shooters. Everybody should go back and read Jef’s original post in which he lists all the development possibilities already sitting waiting in the city for someone with vision and deep pockets. One of the reasons that that the Allens Ave area is so blighted and under utilized is because of the plans from both Cianci and Cicilline have put forth. Nobody is going to build the types of industrial uses you find at Quonset because there is no certainty that they won’t be forced out. Its one of the reasons we ended up with a scrap yard down there in the first place. They don’t need to build any infrastructure. They just need the empty land. Its a catch 22. You can’t get industrial to come in because of all the plans and you won’t get mixed use developers to come in as long as industrial uses remain. As far as relocating to the Port of Providence, many of the businesses don’t want to move. They are happy where they are. In the end, the city will have to take this land through eminent domain. Something that could drag out in the courts for years. And until they are developers won’t to start any mixi projects. There is one other thing that has to be looked at. The land itself. After 100 years of industrial use who knows what is in the soil. 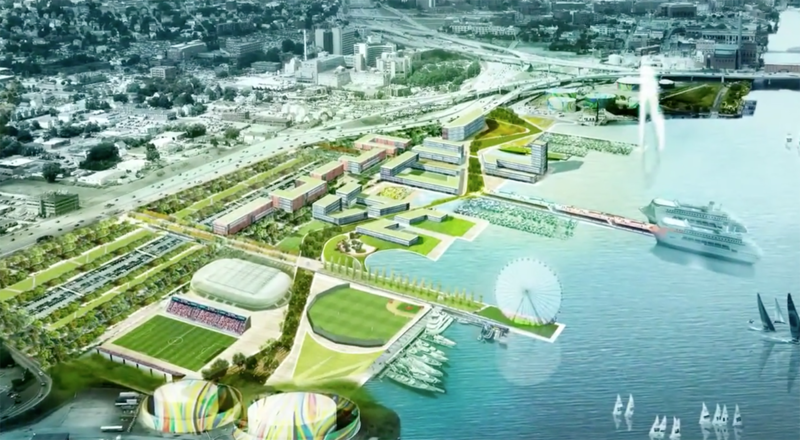 The rendering shows soccer and baseball fields and a ferris wheel on soil that is all going to have to be remediated before any of that happens. It can be done but it is very expensive. Who is going to pick up the tab? You can go to the EPA but do you how long they will take to make that happen. There is lower hanging fruit that should be able to generate the kind of tax revenue the Cianci plan touts and can do it now. Not 10 to 15 years from now. > Everybody should go back and read Jef’s original post in which he lists all the development possibilities already sitting waiting in the city for someone with vision and deep pockets. It’s a vast swath of deeply discounted waterfront property. The risk/return is much higher than capitol center, with fewer interests/NIMBYs than Fox Point. This is going to attract a different type of investment, and the investors are already there. Conley has been there for decades. Just because you don’t like Cianci doesn’t mean this isn’t a unique opportunity or a bad idea. The east side has spoken. Status quo for the waterfront. Right, well since this was never anything more than a pipedream and pretty picture Cianci was using to convince a few dimwits that his election would initiate a magical new renaissance for the city, there’s really nothing lost, is there?